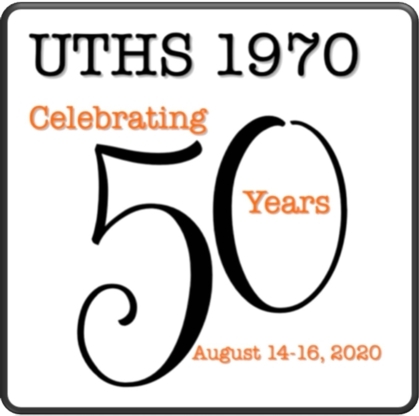 Block out the weekend of August 14-16, 2020 for our 50 year class reunion activities. For updates on the reunion, click on the 2020 Reunion link on the navigation bar. The May 2019 Lunch Bunch gathering will be held at Frank's Pizza on May 4. Hope to see you there! Paul and Debbie (George) Laird were recently featured in a newpaper article after sending their 40,000th handwritten card. Paul began sending postcards 27 years ago to celebrate birthdays, anniversaries, and holidays with family and friends across the globe. It's evolved into quite a hobby for the Lairds. Ken Archibald on the death of his sister-in-law (Candace) on April 11, 2019. Scott Stephens on the passing of his father-in-law on March 12, 2019. Bertha Alejo Martin on the death of her son on March 2, 2019. Jim Andon on the death of his brother on February 14, 2019. Elva Gamino-Charette on the passing of her sister-in-law on February 8, 2019. Francisco Sierra on the passing of his brother (Simon) on February 5, 2019.
the family and friends of our classmate, Cindy Dooley Brobst who died on February 4, 2019. Steve and Sandy Stenzel Miller on the death of Sandy's mother on January 15, 2019. Michelle Chuich Hinton on the passing of her sister on January 12, 2019.
the family and friends of our classmate Jerry Myers. Jerry died on January 5, 2019. RIP, Jerry. Kathy Setser Stephens on the death of her sister (Vicki) on January 5, 2019.